Last Friday I went to a sold-out book reading in Coolidge Corner. 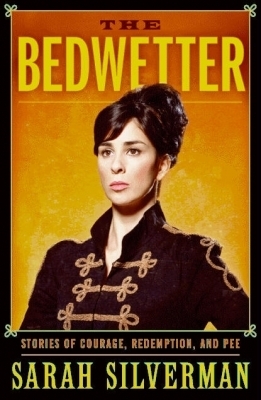 Sarah Silverman, probably the most (in)famous Jewish woman comedian today, was reading from her new memoir, The Bedwetter: Stories of Courage, Redemption, and Pee. Since she is without a doubt a “Jewess with attitude,” I thought it was important that I be there. Sarah Silverman took the stage wearing a knit Red Sox hat, sweatshirt and jeans. She could have blended in with any crowd in Boston. Relaxed and casual, she began by reading an except from her book about the messages her father leaves on her answering machine, which she described as “comedy gold.” (They were.) It gave me a peek into her family life, and I found myself wanting to learn more. Without further ado, it was time for questions and answers. Overall, I was impressed by the “real” Sarah Silverman. She spoke with an unaffected eloquence, slipping GRE words in amidst her “likes” and “ums.” She answered questions very honestly and earnestly. One young woman asked her if she would like to go out drinking with her and her friends after the book signing. Sarah replied with a touching “Awwww,” followed by a pause and then, “No.” While she “wanted to want to go out,” she explained, she doesn’t drink and was really looking forward to going home and watching Law and Order.